Tulips are gorgeous spring flowers, but they have a limited season so why not crochet some to display all year round? 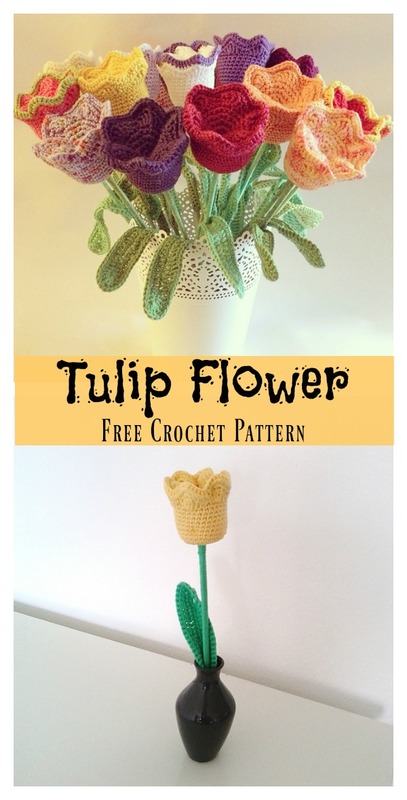 The Tulip Flower Free Crochet Pattern is the perfect love flower to make a bouquet with. It can be worked up in just about any color with your own hands in just a brief amount of your time. They work very well as a decoration around the house to brighten up any room. These can also be wonderful homemade gifts for friend and family, they never wilt. Thanks let’s Yarnify and Crochet Crosia Home for sharing the wonderful free crochet patterns. The links for the free patterns are provided below photos. Happy crocheting.